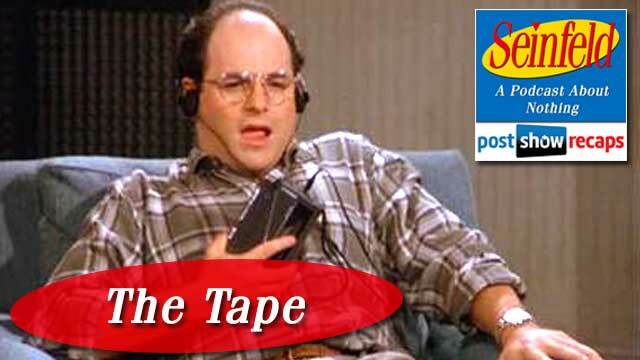 Rob Cesternino and Akiva Wienerkur worked on their throatiest, sultry voices for this week’s podcast as they breakdown “The Tape”, which first aired November 13, 1991 as part of the third season of Seinfeld. Rob thought this episode really lived up to the moniker of being a show about nothing. Akiva agreed, thinking it was run of the mill, but still funny. Before discussing the plot, Akiva had some current Seinfeld news to share. On Saturday Night Live’s Weekend Update, Michael Richards was mentioned as being forgiven during a story about Bill Cosby’s controversy. Also, he had a not so fun fact, Carol Ann Susi, the voice of Howard’s mother on The Big Bang Theory, passed away. She also played the lady in the unemployment office in “The Boyfriend”, where she convinces George to date her daughter in exchange for him to continue receiving benefits. Jerry’s opening standup is a dated joke about hair transplants. Rob felt that you wouldn’t hear this bit in 2014. The first scene is in Jerry’s apartment where he is listening to his standup performance on a tape recorder. George comes into the apartment and asks Jerry if he used the bit he gave him about the big toe being the Captain, but Jerry says he tried it and it didn’t work. Akiva wondered if comedians often record their performances, which Rob confirmed is a common practice. Rob also shared a story from his year or two stint into the world of standup comedy where an audience member with turrets syndrome shouted throughout his se derailing the whole thing. George is very excited to talk to Jerry about how he saw on CNN that the Chinese have come up with a cure for baldness, so he wants to call and order this cream. Meanwhile, Jerry gets to a part in his recorded set where a woman starts saying dirty things into the microphone in a breathy voice. George and Kramer take turns listening to the tape, both blown away at how hot and heavy it is. In the next scene at Monks, George is still talking about the cure for baldness. Jerry gets up from the table, and George tells Elaine about the racy message left on Jerry’s tape recorder. She then does the voice, shocking George that she came up with all this dirty stuff. From learning this, George is now visibly attracted to Elaine now. When Jerry comes back, Elaine asks Jerry about the tape. He is quite arrogant about it, saying how this happens to famous people all the time, and it’s not a big deal. Back at Jerry’s apartment, George is on the phone trying to order this cure for baldness. Kramer comes in with his camcorder, pretending to be filming a documentary where Elaine is an adult film star. Jerry plays along, pretending to be the director who discovered Elaine through some friends at the Coast Guard. Elaine continues to play along, making George blush in the process by referring to him as her costar. Rob felt this was a racy premise for 1991. Kramer’s Chinese food delivery shows up, and we get to meet Ping, the delivery boy for the first time. George asks him if he can get on the phone and translate with the balding cream company. Ping does this, assuring George that if he sends the money, he’ll get the cream. Rob enjoyed how Ping took a jab at George by jokingly telling him one of the side effects of the cream was impotence. In the next scene, George and Elaine are talking, and George is still hot under the collar about Elaine on the tape. Jerry meanwhile is back at his apartment, and thinks he has tracked down who left the dirty message, still not aware that it was Elaine. George comes in with balding cream, and Kramer goes to get the camcorder so they can track the hair growth. As he applies the cream to his head, they all notice that it smells terrible. Rob questioned why George wouldn’t rub the cream into his head rather than having it sit on top. When George thinks that Elaine is coming upstairs, he rushes in to wipe off the stinky cream. Kramer randomly asks Jerry how often he cuts his toenails, to which Jerry replies roughly every two to eight weeks. Kramer tells him he had cut his girlfriend with his big toe, and Jerry brings out George’s joke about the big toe as the captain. Meanwhile, Jerry has a date with the woman he thinks left the message, though she didn’t respond like someone who would say the filthy things on the tape. George comes up wearing a giant cowboy hat to hide the cream on his head. Kramer wants to get his camcorder to check the progress. While he’s at his apartment, George finally discloses that he is attracted to Elaine. Floored by this new information, Jerry tells Kramer to leave again once he gets back with the camera. Kramer asks if they are going to talk about the big toe captain, which makes George mad that Jerry is using his bit. Akiva shared a story he heard about frequent writer Larry Charles, and how he used to stand outside comedy clubs and sell jokes for five dollars. Jerry wonders why George all of a sudden has developed feelings for Elaine, and George tells him it was when he learned that Elaine was the one who left the message on the tape. Elaine comes up, notices the horrible smell from the balding cream. George very slyly motions toward Jerry, as if the smell was coming from him. Elaine finally reveals to Jerry that she left the message on the tape, and Jerry tells her he knows, that George told him. Rob wondered why Elaine decided to tell Jerry now. Akiva thought perhaps she felt bad since he was on a witch hunt to find who had done it. Much to Jerry’s chagrin, George decides that he has to tell Elaine he’s attracted to her. Kramer disrupts this awkward moment, bursting in with proof that George’s hair is growing, though it was not that much. After Elaine leaves, they all fight over who gets to listen to the tape. 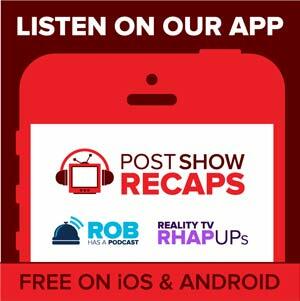 Rob felt this was a weak ending to the episode. Akiva agreed, adding that the entire storyline was pretty basic throughout. There were a few things that would be different about this episode if it aired in 2014. First, George wouldn’t need to call China for a cure for baldness, he could just go on the internet. Also, Jerry could just record his set with a cell phone in his pocket. Lastly, Rob felt strongly that nobody would be going crazy about some dirty talk on a tape in a time where such racy material is easily accessed through the internet. “The Tape” did not fair as well in the rankings as some other season three episodes, falling way down the list to 149. Rob pointed out that if this episode has 148 better than it, then Seinfeld really is one of the greatest shows. There were only a couple of emails in the mail bag this week. Emailer Travis asked Rob and Akiva how they would rank George’s cowboy hat, versus the toupee and the rat hat. Both agreed that the rat hat and toupee are more iconic, though the cowboy hat is pretty funny also. Johnny De Silveira asked if either of them are balding or expecting to go bald. Akiva pointed out that the way to tell is if one’s maternal grandfather was bald. Akiva unfortunately is on his way there, while Rob said he is holding strong, but to check back with him in ten years.